1. KATB will be playing a Linkin Park song. 2. The Kids Village is OPEN. 3. 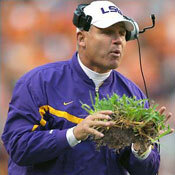 Les Miles eats grass & the LSU players smoke it. 4. The Rapture was today (October 21, 2011). If you are reading this, I hope to see you in 7 years. 5. My blog has more hits than Brookwood where you at?